The Gloucestershire Guild of Craftsmen is delighted to welcome new Associate Member, Helen Foot. 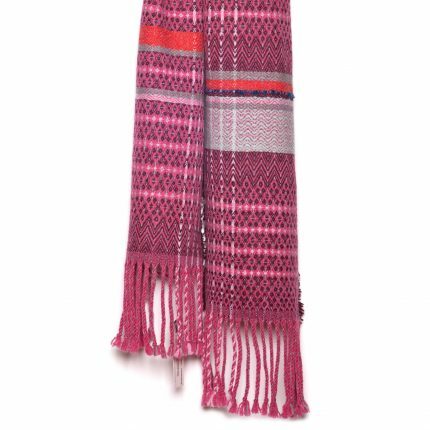 To help us launch 2018, Helen will show a collection of her handwoven scarves in the window of the Guild at 51. Shrewsbury born Helen developed her love of textiles at an early age, “every time we visited my grandmother she would be knitting something, it was fascinating to watch”. She studied a degree in textile design at Winchester School of Art and then spent a couple of years after graduation working as a freelance weaver before becoming the studio manager for London based woven textiles studio, Wallace Sewell. Helen then returned to college, embarking on a two year Masters at the Royal College of Art, graduating in 2010. She has since designed fashion fabrics for Paul Smith and Alexander McQueen. Helen moved back to Shrewsbury after completing her MA and started her label Helen Foot Design. Her playful style has been described as ‘Rebellious Nostalgia’. 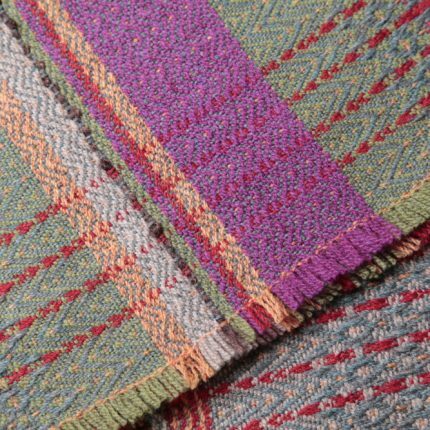 With a strong sense of colour and a passion for keeping traditional skills alive, Helen creates beautiful fabrics in harmony with the loom. Using a 24 shaft computerised AVL loom, Helen handweaves her collection of scarves and other goods. Her inspiration is drawn from traditional handcrafts such as Aran knitting and cross-stitch which she merges with contemporary geometric patterns and bold colour combinations. 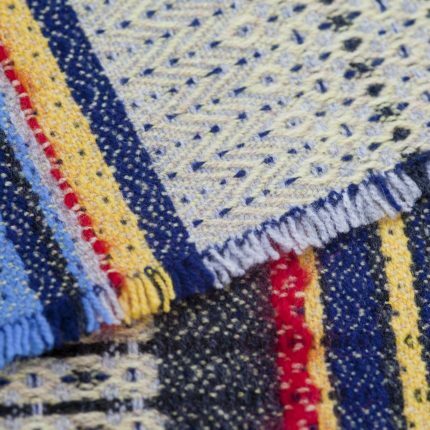 In 2011 Helen was selected by the Crafts Council for their Hothouse program which supports emerging designer makers and compliments her practice with University Lecturing, curating and commission weaving. Helen relocated her studio to rural Herefordshire at the end of 2016 and is now situated in a beautiful converted school on the grounds of Croft Castle.